X9 Internet was founded in the UK in 2000. We saw demand for dependable and reliable yet low cost web hosting service and developed the budget hosting model. This was during a time when a web hosting account was not cheap. Some firms were charging nearly £200 per year and resources were not plentyful either, at best you got around 50 Mb of disk space with 500 Mb of traffic at the time. Out of thousands of websites selling hosting on the Internet today, only a tiny fraction of these sites belong to data centres. The bulk of these sites are run by their channel partners, resellers and sub resellers. 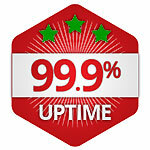 The safest source for a reliable hosting service would be to buy direct from a data centre. But this is usually very expensive - and it's NOT because it is the very best service. Data centres could not stay in business if they only sold to end users. Their business module is based on reselling almost all of their resources through hundreds of channel partners such as X9 Internet. It would therefore be dangerous for them to compete with their partners, so they set their enduser prices high. A channel partner offers an excellent service with good support at a very low price and can do so because it does not have huge datacenter expenses. This is your ideal hosting provider. It is virtually impossible to tell if a web host is a data center, channel partner, reseller, sub-reseller or just a bloke who is doing this from home for a bit of beer money, when all have excellent informative and professionally looking web sites. It would be best to look at their domains and to do a whois to see when they were registered. We registered x9internet.co.uk in 2000 - so we've been around for a while.